The Instant Pot has revolutionized the way I cook due to it's ability to cook whole food meals that would normally involve more planning and prepping in an hour or less. 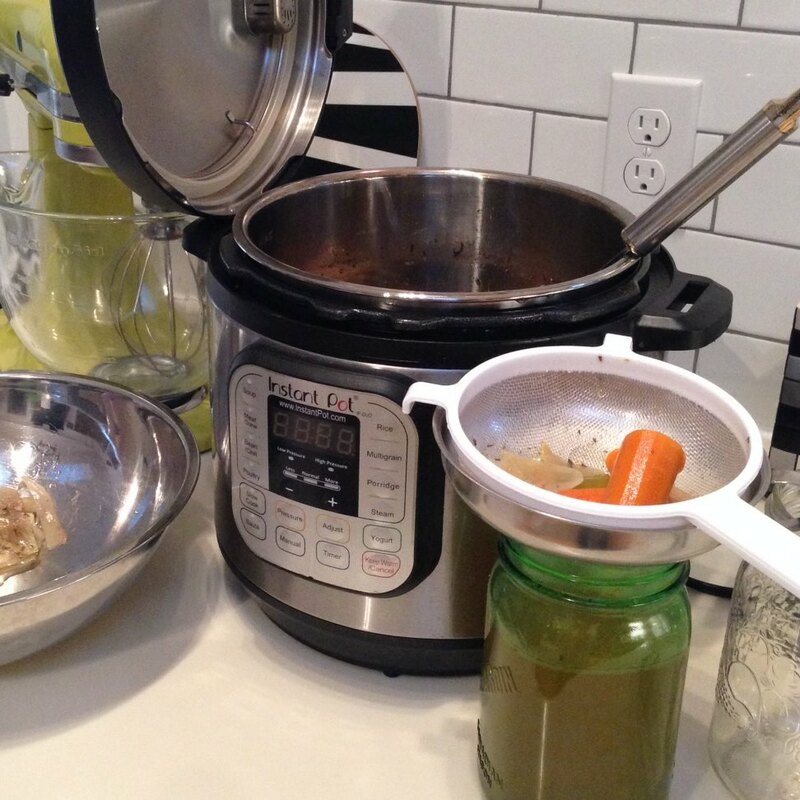 It is perfect for everyday cooking when you need to get dinner on the table quickly, or as you will see below allow you to make nutritious bone broth in 2 hours vs. 24 hours in a slow cooker. 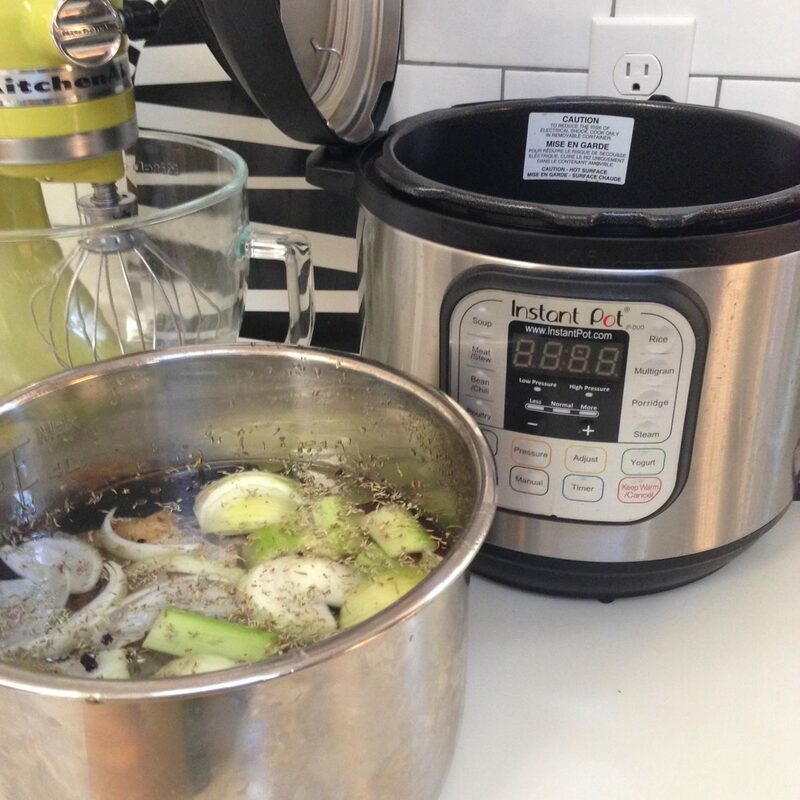 Learn more about the instant pot. Bone broth has gone from a quiet corner stone in many traditional diets, to an integral part of Paleo inspired and healing diets. As bone broth simmers in a slightly acidic liquid (the acidity comes from the addition of apple cider vinegar) collagen is released from the bones. Collagen contains the amino acids glycine and proline, two important nutrients that promotes healthy growth of bones, tendons, ligaments, skin, hair and nails. Collagen is also healing to the gut and nourishing in general. I always try to have a few jars of bone broth in my fridge or freezer so I can quickly make a soup or stew. I also love drinking bone broth as is or spun in a high speed blender like a Vitamix, with a fat (I often use duck fat) for a “latte” style broth. Place all ingredient in instant pot and cover with filtered water. Do not fill more than 2/3 full. Cook on high pressure in instant pot for 2 hours, let pressure come down naturally. Set time using the "Manual" button. Place a wide mouth funnel in a 1 qt canning jar and a fine mesh strainer inside the funnel. Ladle broth from the instant pot in to the jar, leaving an inch at top if freezing. Allow to cool then place lids. Store in fridge for 3-4 days or freeze. Add sea salt to taste at time of use.